This page provides an overview of the Vineyard section. We cover the history of the vineyard, provide an outline of the section, review our practices over the last 20 years and describe what we measure and how we manage with the collected data. We acquired the property in 1996 and planted the first vineyard in 1997 in the Lower Field (right in picture). 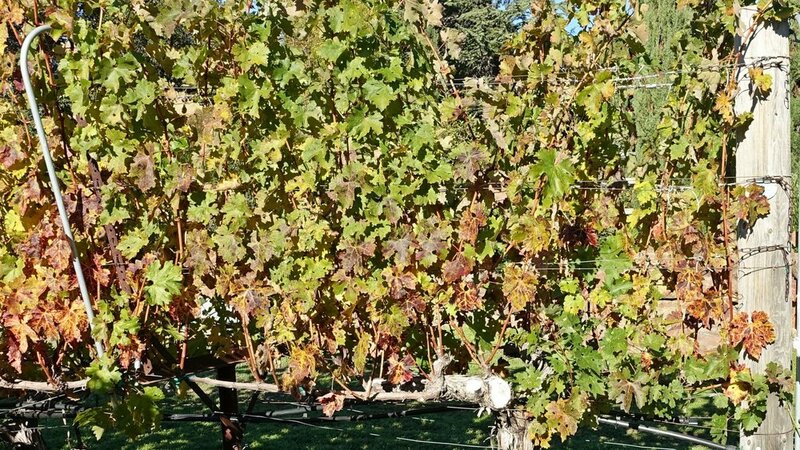 Being new to the area in 1997 and babes-in-the-woods what regards vineyards, we followed the recommendation of a friend to hire an expert in establishing and maintaining vineyards: Ron Mosely, then at Cinnabar Vineyards & Winery. Ron designed and planted it with Cabernet Sauvignon vines, and he managed the vineyard for the first 3 years – so we were not really involved in the process. In 2007 we decided to build a small winery (to the left of the Lower Vineyard). In 2014 we decided to plant a second vineyard for 2 reasons: first the yields in the Lower Field were dropping due to diseases; second, we wanted to augment our grape choices for blending the Cabernet Sauvignon with Merlot, Cabernet Franc and Petit Verdot to get more of a Bordeaux style wine. We planted the Upper Field on our own with some consulting support from Ron Mosely. Leaves are falling while the vine above ground goes dormant. By mid-December, all leaves have dropped, and the plant goes dormant until March. The vines accumulate carbohydrates in the canes, and roots develop further. In late March new buds swell and break out. In April through May new shoots are emerging from the buds. In late May the vine flowers (pollination of grape berries). In June the flowers set to berries, the berries get larges and shoots grow longer through early August. In August the berries turn from green to red (veraison), start to soften, and build up sugar. Chlorophyll in the berries is being replaced by Anthocyanins. Through late September the berries ripen, accumulating sugar and tannins. In late September / early October the berries have reached full ripeness and are ready to be harvested. In October the leaves remain, and some turn red. Plant Management involving: pruning, shoot-thinning, hedging, shoot-positioning, trellis repair, lateral removal, leaf-thinning, cluster-thinning, and replanting & grafting. Nutrition Management involving soil and foliar testing, soil amendments, foliar sprays, irrigation maintenance and irrigation. 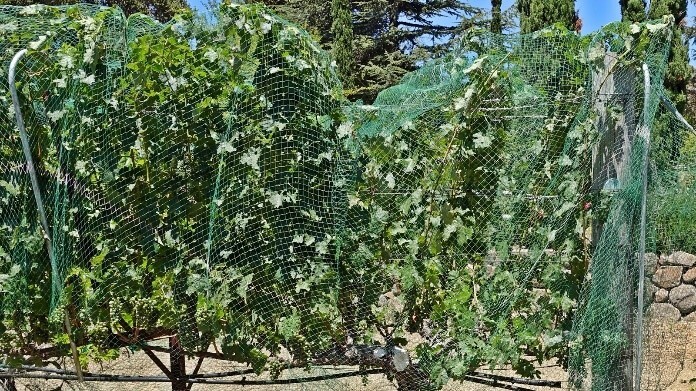 Pest Management: involving netting to protect berries from birds and insects, spraying fungicides (mostly against mildew) and preventing ground animals (gophers, squirrels, rabbits, deer, coyotes and turkeys from harming the vines and their roots. 2000 – 2009 Getting Started: During the first 10 years, we moved from outsourced vineyard management to doing everything ourselves. The vineyard was planted in 1997 and managed for the first 3 years by Ron Mosley under contract. We basically watched the vines grow and organized the picking crew for the first harvest in 2000. Starting 2001, we engaged Rick Anzalone to support and teach us how to manage the vineyard ourselves. In 2002 we applied for an Operator Licence and started reporting the spray activity directly to the Santa Clara County Dept of Agriculture. Vintages 2002 and 2004 were dropped because of our failure to spray sufficiently against mildew. Until 2004 we sprayed by hand with backpacks and hoses. 2010 – 2015: Better data collection & improving practices: During the next 6 years 2010 – 2015 we further improved our practices. The following table provides detail during this period. In 2012 we started to take detailed notes on our vineyard practices. We finally succeeded in keeping the deer out and the gophers under control. We started to remove all laterals to control canopy growth. 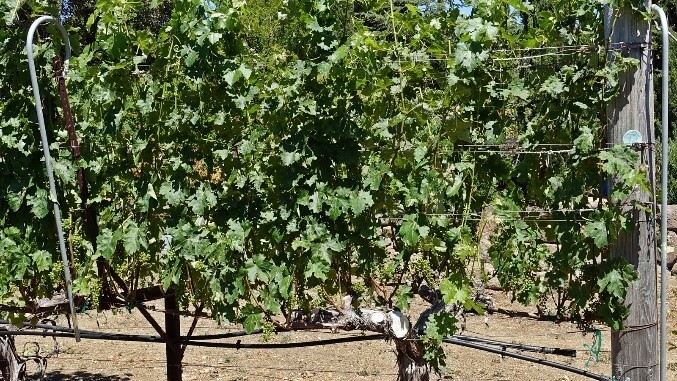 In 2012 we switched to pruning with electric shears We removed most laterals to control canopy growth, and we thinned the crop to even out maturity. 2013 produced the highest quality fruit. In 2015 we started using Vitiseal, a new sealant for cutting wounds against Eutypa and other fungi. The first results are very encouraging. Unfortunately, we were distracted with planting the upper vineyard and failed to spray early in the season, so we got significant mildew infections which led to poor fruit set and significant mildew damage. 2016 onwards: managing multiple varietals: In late 2014 we decided to plant a second vineyard in the upper field with vines that complement Cabernet Sauvignon for Bordeau blends: Cabernet Franc, Petit Verdot and Merlot. The vineyard was planted in spring 2015. The next 5 year period is mostly about further improving the vineyard practices and getting a handle on keeping more useful records. 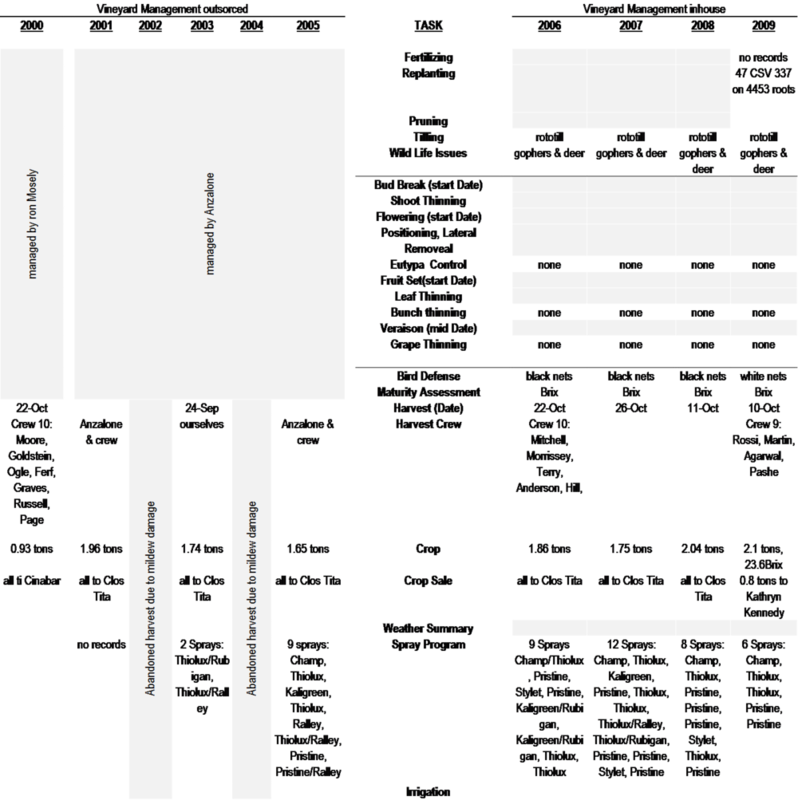 Following are screenshots of the “REVIEW: Vineyard Actions” – layout. The first lists all the individual activities of 2018, the substances added and the manhours spent on each (note the list is longer than what the screenshot reveals). The second provides an overview of the “substances added”, the Sprays and Soil Amendments. The third shows the cumulation of manhours by vineyard block and type of activity, and the last screenshot summarizes the weather conditions.